It was a mostly disappointing weekend. Saturday morning I rented a truck to take the tiny house down to the Austin Home and Garden Show. The truck didn’t make it once we got off the driveway. 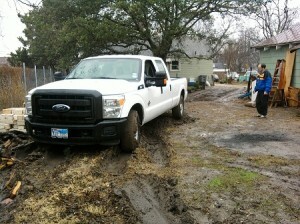 I was able to get the truck backed up to the house but without the traction of dry ground, it wasn’t going anywhere. It continued raining and by the time we realized we weren’t going to be moving the tiny house, the truck was stuck. We used boards, plywood, bricks, logs, and spent 3 hours trying to get the truck to just move its own weight back to the driveway. The guy staying on the property had a come along winch and we used that to pull the end toward the driveway enough for him to be able to use his truck to pull us out. After 3 hours of sogging it out in the mud, we had it in our minds that the rental place was partly responsible for renting us a truck that couldn’t pull itself out of the grass. Now that I’m rested, I realize we shouldn’t have rented it in the first place given the weather. But Saturday, I tried arguing our case with the rental place to no avail. Then Sunday, the eBay auction ended. Despite 23 bids, 150+ watchers and 3000+ page views, the top bid only ended up being $4700. I’d set the reserve at $10,000 so I’d at least recoup the cost of building supplies and a token amount for labor. That said, I’ve had several calls but no one has made an offer yet. I realize that it often takes months to sell real estate and that January isn’t a good month for it. Nevertheless, I’m willing to entertain offers for less than the original $15,000 at this point. If it doesn’t sell in the next month or so, my wife and I plan to move in to it when our lease ends the following month. That may end up being a blessing in disguise in the long run but this weekend wasn’t what we’d been expecting. I am doing a master’s thesis called “Down Sizing the American dream. I was wondering if I could pick you brain a little? I am also here in Austin and going to school at St Eds. Hi, Bill. I recently moved to Arlington, TX to do a masters in architecture. I’d be happy to answer any questions that I can. Email me directly at louisrburns@yahoo.com.